Hot Fudge Sauce as a Topper... Yum! Yum! 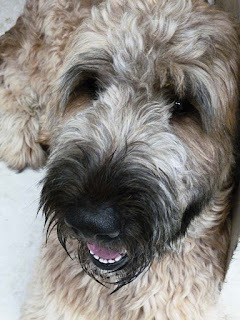 Recently, I had a BIG birthday... How BIG you might want to know? Well, big enough, let's say, that I needed to make a HUGE cake to hold many, many, many candles. So,with all that fire, it seemed to me that surely this was the birthday from Hell and that the Devil had to have something to do with it. Making a Devil's Food Cake for my birthday would be the natural solution to this problem. 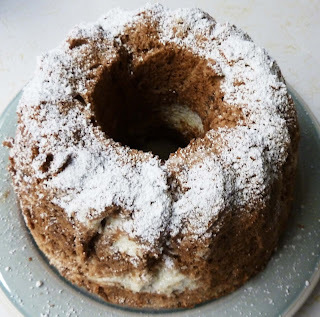 But as I sat there contemplating this, I knew that what I really wanted was an Angel's Food Cake. I was definitely on opposite sides! 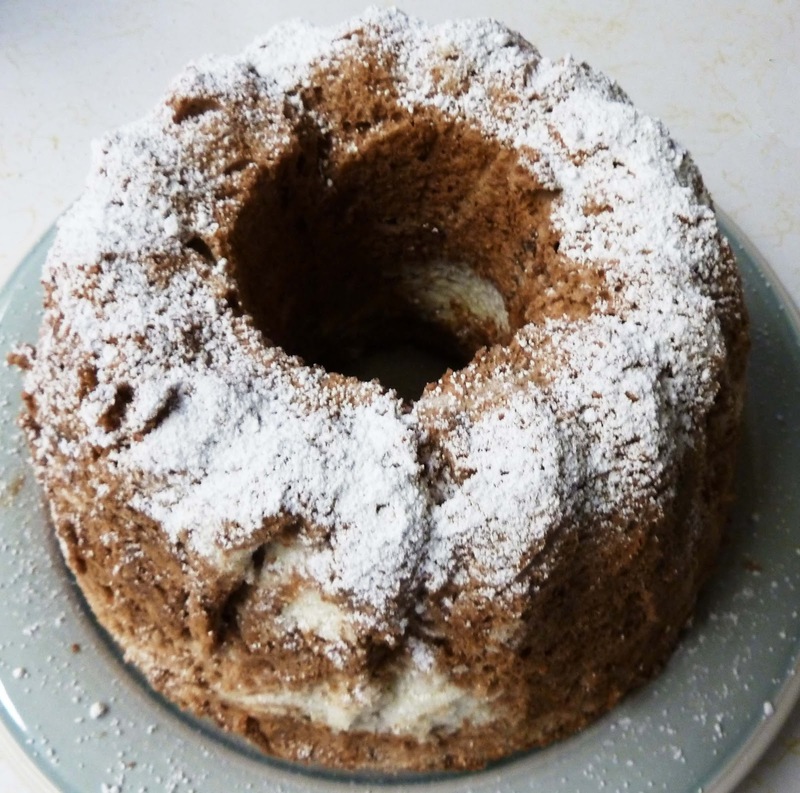 So how could I possibly turn an Angel's Food Cake into a devilish delight suitable for all that fire? Chocolate, of course! 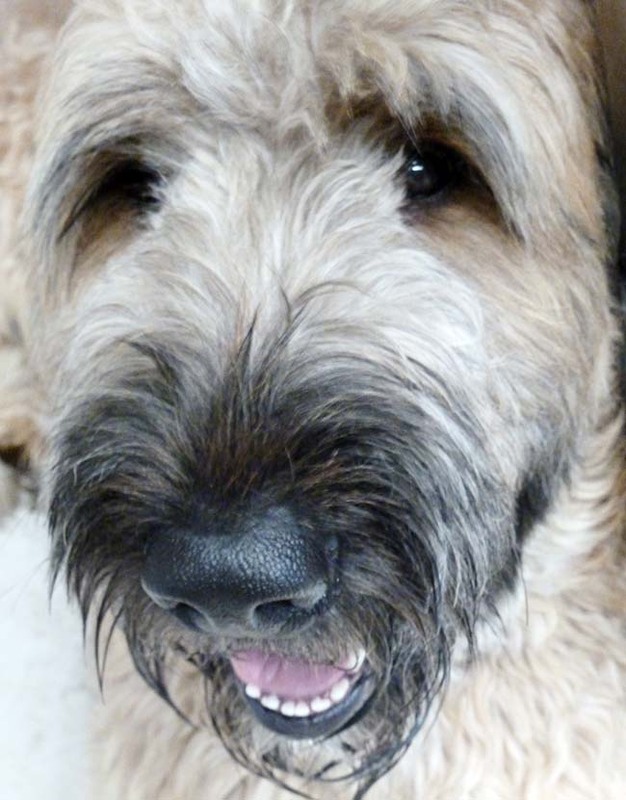 So as I sat there, watching my dog, Kip, count all the eggs in a egg box, I came up with the idea of making a Devil Dog's Chocolate Angel Food Cake! Yes, not only would I make it of chocolate, but I would add the delicious flavor of orange and the taste of the seductive liqueur, Grand Marnier. By now, anyone following this blog knows how much I love to add local flavors to different foods, and I love the combination of orange with dark chocolate. I also adore the taste of Grand Marnier with dark chocolate. Let's face it, I just love dark chocolate.It was my birthday and I'd have chocolate if I wanted to. So, off I began with my concoction. This cake is a bit of work, so be prepared to spend some time on prepping. 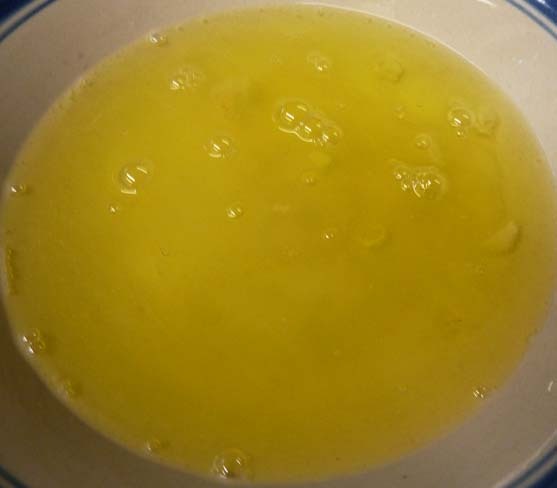 Begin by separating the egg yolks from the egg whites. It is best to separate the egg yolks from the egg whites while the eggs are cold. 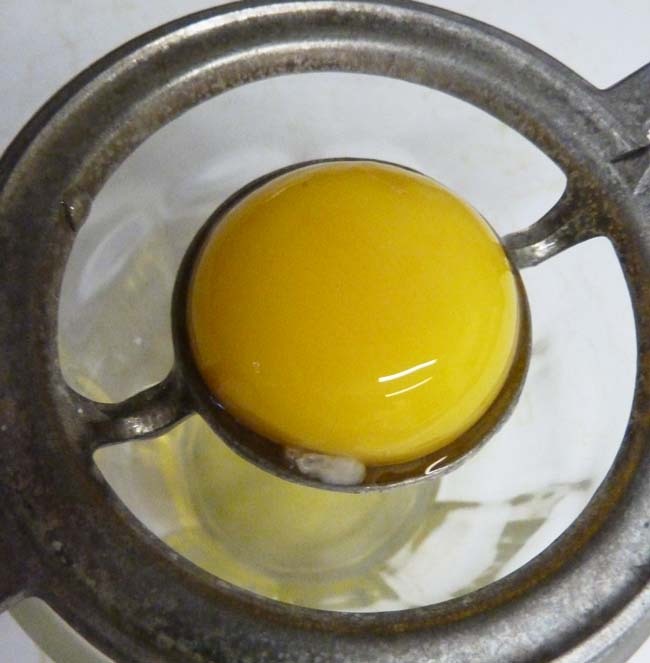 Egg separators like the one shown in this photo, make the job easier. Once you have the egg whites separated, cover them and let them stand so they can reach room temperature, about twenty to thirty minutes. 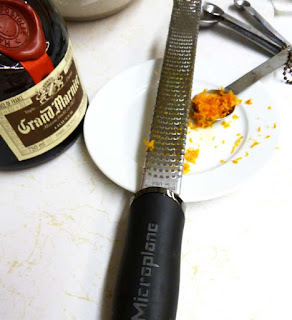 Grate the rind of an orange until you have 1 tsp, careful not to eat into the pith of the fruit, which is bitter. A great tool for this purpose is the Microplane. 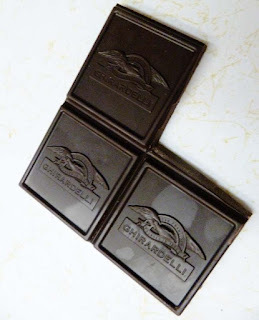 Break off three squares of the Ghiradelli 100% Cacao Unsweetened Baking Bar. Butter the bottom of a saucepan and add the chocolate squares and the 1/2 tablespoon of butter. 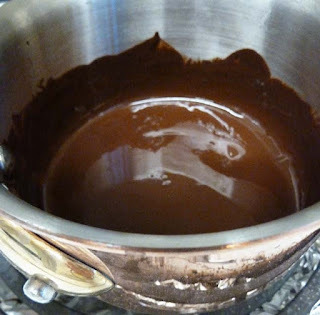 Melt the chocolate and the butter in a sauce pan on medium heat, add the cream, orange zest, and Grand Marnier, and set aside so that the mixture reaches room temperature. Grind the granulated sugar in a blender. 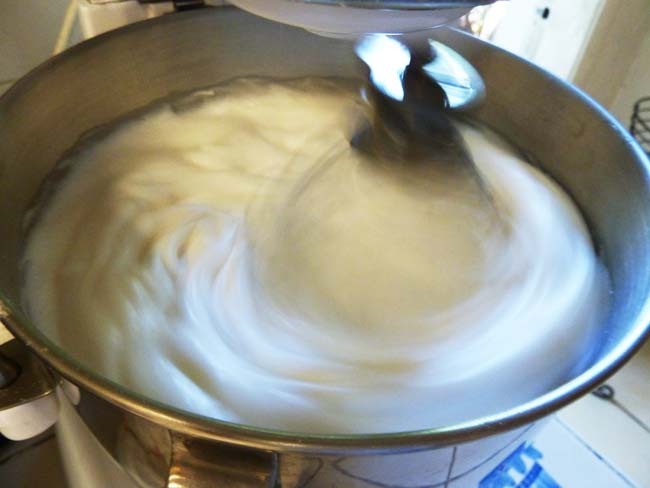 By doing this, it makes it easier to incorporate into the egg whites when you whip the sugar into egg whites. Sift the cake flour so that you have one cup of sifted cake flour. Give the dog the bad news that it's a "chocolate" cake and that unfortunately, this is not one goodie he'll be able to share in. Hand him a hankie and proceed to the next step. 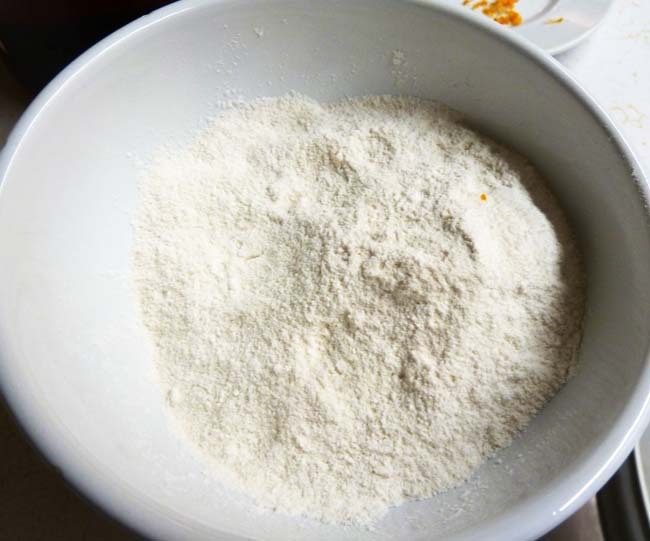 Combine 3/4 cup of ground granulated sugar with the sifted cake flour and the salt. 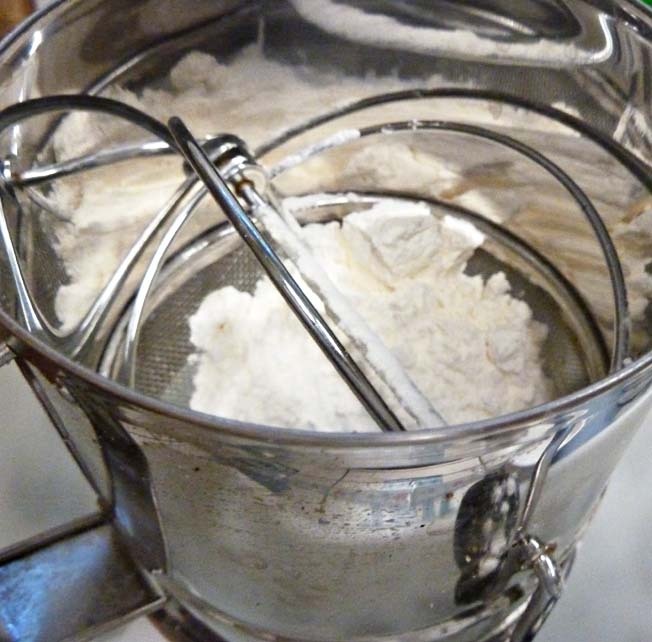 In a blender with the whisk attachment, beat the egg whites until they become foamy. You will know when they are foamy because you will see a mass of tiny clear bubbles. Add the cream of tartar which stabilizes the egg whites and prevents them from over-beating. 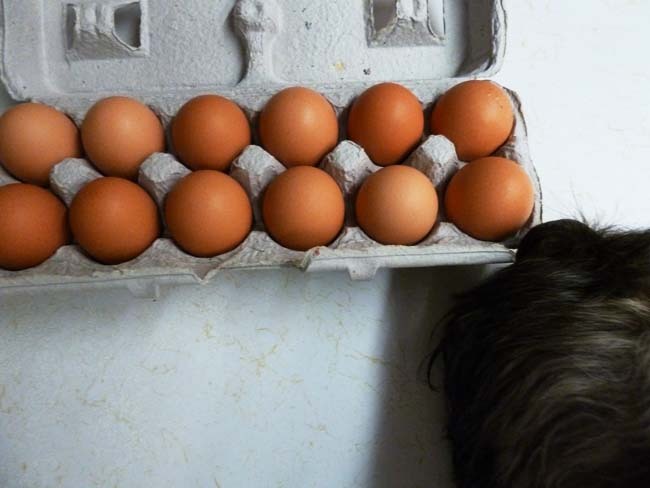 Continue beating the eggs until soft peaks form. Typically, you will know that you have soft peaks when you lift the beaters and the peaks droop. 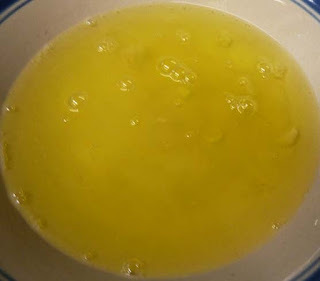 Add in the additional cup of sugar, two to three tablespoons at a time, giving the sugar time to dissolve into the egg whites. 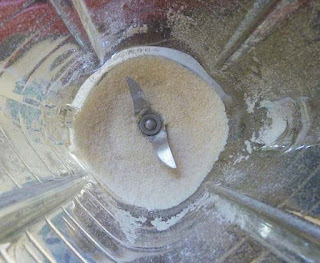 The fact that the sugar is ground at this point makes it easier for the sugar to dissolve more quickly into the egg whites. Beat until stiff peaks form. 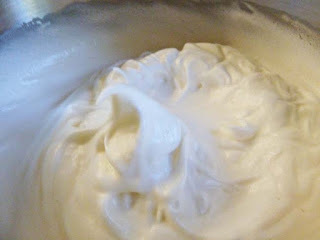 You will know you have stiff peaks when you lift the beaters and the egg whites hold their shape, but still look moist. The photo above shows stiff peaks. 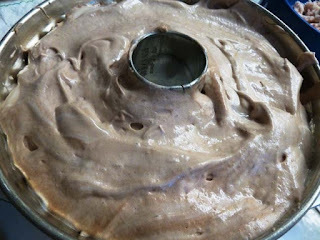 Take about 1 cup of the beaten egg whites and add it to the chocolate mixture. Whisk the egg whites into the chocolate mixture to give it some lift. Do not over whisk. Add the flour mixture to the remaining egg whites gently, but quickly folding the flour into the egg whites. I did this in my blender with the whisk attachment, and it came out quite nicely. 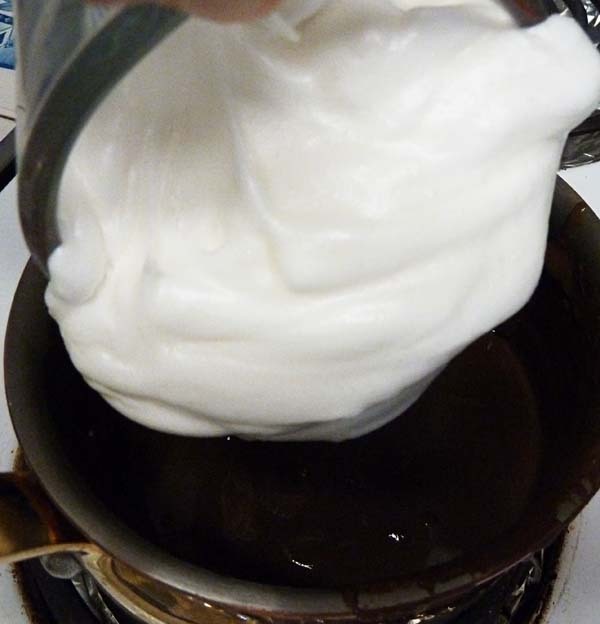 Once that is complete, gently fold in the chocolate mixture into the flour egg white mixture. 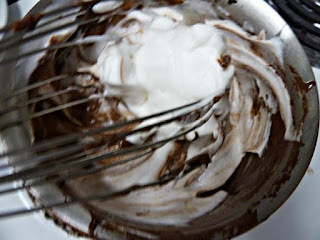 I am careful about this step, because overworking the batter, will cause the fluffiness to deflate. Pour the batter into an Angel's Food pan. I used a Kugelhopf pan, which I think gives the cake a prettier shape and works just as well. Put the cake into the oven and let it bake for approximately 35 to 40 minutes, or until you can insert a knife in the center of the cake and it comes out clean. 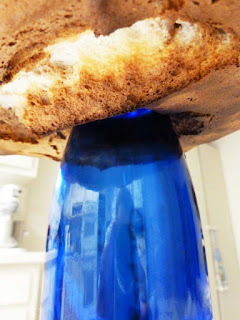 When you take the cake out of the oven, immediately place it upside down on an empty wine bottle and let it cool completely. Remind your pooch, that it's a chocolate cake and that he still can't have any! This is the hardest part of making the entire dessert! Sprinkle powdered sugar over the top. 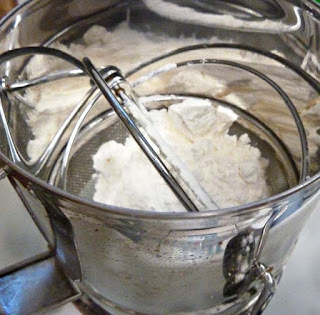 The easiest way to do that is to put a couple of tablespoons of sugar into a strainer and dust the sugar over the cake. 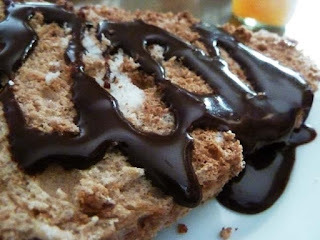 For this cake, I also like to add as a topper Em's Mom's Hot Fudge Sauce. It is a delicious and devilish addition to this cake! In the end, I decided not to put any candles on the cake, It was hot enough as it was!